John was baptized 19 February 1800, probably at what is now Old St. Edward's Church and recorded at Trinity Church in nearby Digby. (1) He had a small farm in Clementsport and received a Justice of the Peace commission in 1835. (2) When Horatia (Ditmars) Cunningham visited him in the 1850s, she mentions in a letter that he gave her baby Arthur a hat, and that her father enjoyed playing with him and wished to keep him for himself. The letters also mention Arthur being taken with the piglets and goslngs. His father's will mentions John's orchard south of the house. More about him may be found in Nova Scotia records. 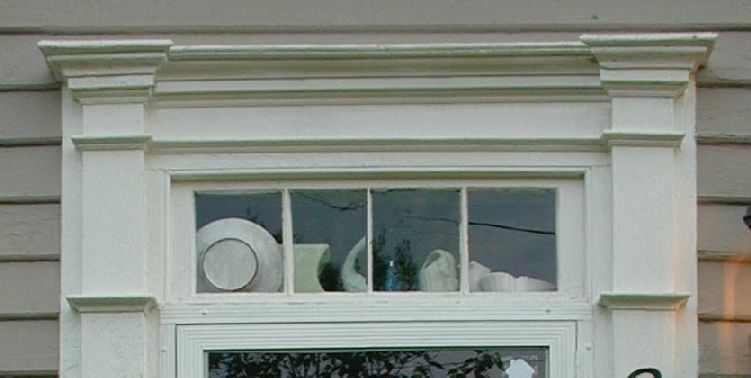 His house, apparently built in 1827, given iron bars in two fireplaces that display his initials and that date, still stands and is now a "bed and breakfast." 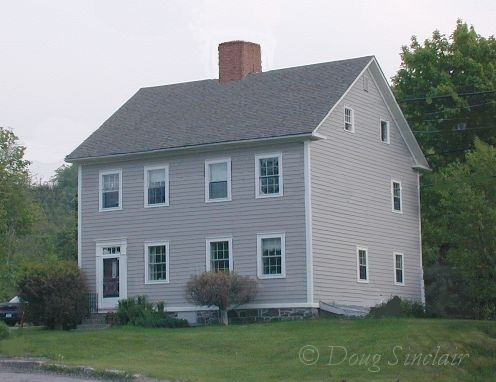 The house was built on his father's property and it may have been deeded to him in 1834. (3) It surely was there that Horatia and her sister were born. John's house in Clementsport, NS. Some digital tricks have been played on the house itself to approximate a more 19th century look, such as the larger chimney, but it otherwise retains much of its original appearance inside and out. There were complications when Horatia was born and a doctor was called for help. He arrived drunk and useless and was put to bed. Horatia, Sr., died soon after. John remarried and had three sons. For some reason, Horatia, Jr.'s, Gesner aunts in Belleisle were allowed to take her to their house, where she was raised. John's death date and burial place haven't been found, although it seems likely that he is buried at Old St. Edward's, perhaps without a grave marker. 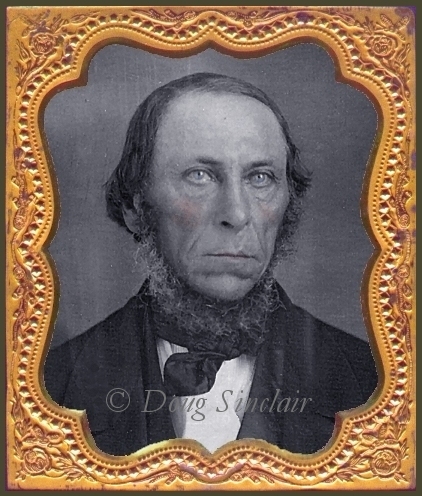 More odd is that there is no record of probate for his estate in Annapolis Co. A note in Virginia Carpenter's family papers says he died in 1878 in Brooklyn, but no evidence of that has been found and it is very unlikely. He had died by 1881, however, since he doesn't appear with his family in the 1881 Canadian census. 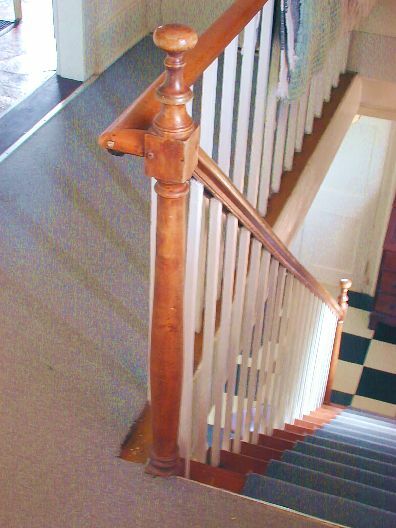 One of the distinctive newel posts in John's house. 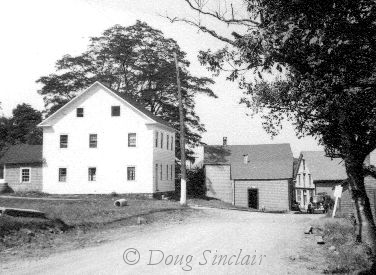 Virginia Carpenter visited Clementsport twice around 1950 and took the picture on the left of John's house. Clementsport once had many more buildings to mark its existence, some of which can be seen in this view. 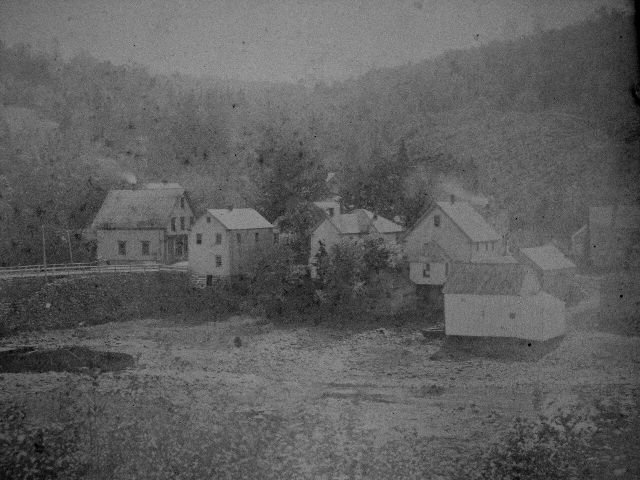 A photo of the same area from across the river is below, date unknown. There were so many commercial buildings that just one end of the peak of the roof of John's house can be seen through the trees dead center of the photo. The end of "Ditmars Long House" can be seen at the right edge of the photo. 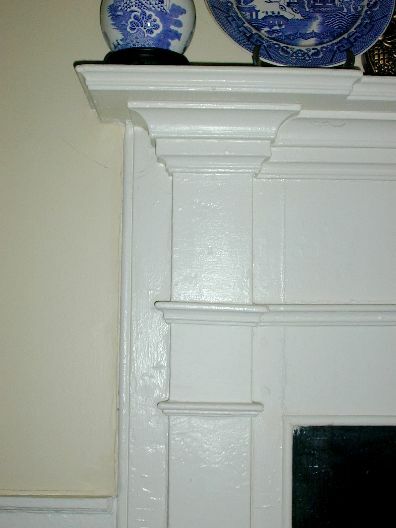 The second photo above is how it looks in 2005. 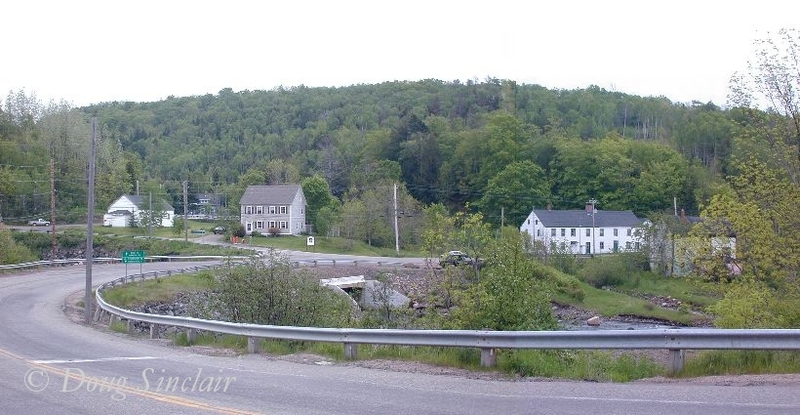 All but three buildings remain: John's house, his father's and brother's ("Long House") and a dilapidated remnant across the street by the water. 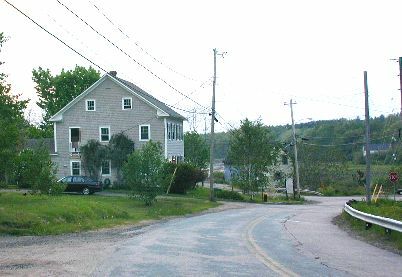 The same view (wider) in 2005, showing unobstructed the two Ditmars houses. While the preservation of the two houses is most fortunate, Clementsport has lost all sense that it was ever a thriving village. As in many other areas, economic changes brought the loss of business and the associated buildings were no longer needed. Over the guardrail and down by the river was the iron works, where the fireplace beams in John's house undoutedly came from. This and a shipmaking business were prominent in Clementsport, but not even a ghost of this past is evident now except for a small, roadside memorial to the iron works. 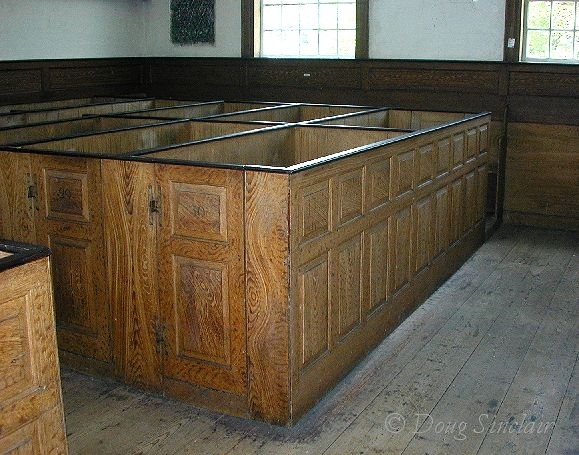 The pew in Old St. Edward's Church used by John and his brother Gilbert and their families after 1857. His baptism appears in Trinity Anglican Church records in Digby. His marriage date comes from the records of All Saints Anglican Church, Granville. Elizabeth Jane Burns is named in family records. 2. Calnek's History of Annapolis County. 3. Annapolis Co. deed, vol. 31, p. 77, not yet seen. Joseph Bouchette, Topographical and statistical description of the provinces of Lower and Upper Canada,etc., (London:1831), p. 50.